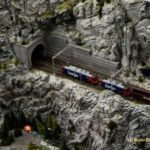 How to have a railway that looks good from a distance with lovely large landscapes features but also works up close with lots of detail visible in your figures and models? 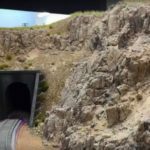 You want a railway: a glorious model railway. You want it to have trains of course but also landscape: rivers, rock faces and cliffs. Your own wonderful miniature rendition of creation. But creating landscapes really means building it in N scale — unless you happen to have a lot of space handy, which few of us have. Landscapes in OO scale need space. However, you also want shops, roads, people — human habitation — to add interest. And to do for little people they really need to be big people. Shoot me for saying this but after building more than a few N gauge layouts I just don’t believe you can do justice to shops, streets and suburban life in N scale. N scale is are just too small to see the intricate details of the figures and models. N scale also seems a bit more limited in the range of accessories you find in and around buildings. It’s got better over the years, but when I visit model shops or browse online there still seem to be far more items of ‘street furniture’ for OO than N scale. So for human habitation, a layout has to be OO. With big small people if you will. Sometimes it’s nice to work on and watch trains running through landscapes and sometimes you want the interest and entertainment of a town scene. How to have both? Few of us have space for two layouts. Darren Hodges has the answer and it’s one I’ve not really seen done before. He’s constructed a layout but with two halves. N scale on one side and OO on the other. He’s used the 1:148 scale of N on one side to fit a lot of landscape features into a small space that just couldn’t be done in space if using OO. On the other side, he has an OO layout for a small town scene so you can see the detail of the figures, cars etc. It gives the best of both world’s in a layout that’s just 4ft square even with minimum radii curves. I say really not because while many others have employed multiple gauges on a layout (for forced perspective) Darren does something different. In an ingenious bit of thinking, he hides the track of each half from the other so the different scales don’t ruin the impression when looking at one side or the other. When looking at the N scale side you don’t see the OO trains and vice versa. And this is all done with oval track plans so the trains can run continuously without needing intervention. Watch the video below and you’ll see how it solves the conundrum. It’s a simple but effective idea and one that really appeals to the creative and inventive modeller in me. If you’re still in the planning stages or your layout, stop now and think about how you could make this work on your layout!